You might be surprised by this but I actually did not even think at all about the Hindenburg when I was painting this. So I was really surprised that so many of the captions and stories were about this great air disaster. There was even a movie about it when I was a kid! So go figure. Even though the majority of entries dealt with this theme I was pretty surprised by them. I knew what was coming throughout Helen Chapman’s story and yet it still satisfied. One part historical fiction one part tragedy it packed a wallop at the end! Not exactly about the Hindenburg and a bit more of a tale dealing with airplanes, I still liked Marlin Bressi’s revisionist history. There was a skit on Saturday Night Live in which a historian asked, “What if Napoleon had a B52?” "Spirit in the Sky" by Marlin Bressi has a similar wry sense of humor about it. Not that it has been the criteria in the past, but I think I chose Stephen D. Rogers’ short caption "To love is to time travel." I liked Rogers’ the best because of it’s sentiment. Yes, I’m sentimental. When I painted the “Best is yet to Come,” I was actually thinking about my relationship with my wife and how it lifts me up. In a way I had a much more specific fantasy of what each of the pictures elements meant. 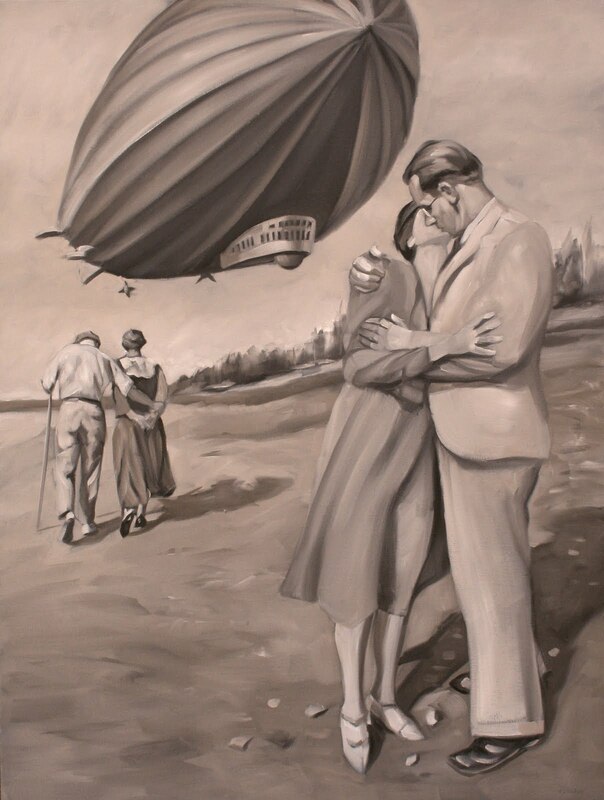 For me it was a sort of metaphorical portrait of how I feel about my wife and I: A time lapse image of a loving couple as both young and old and the dirigible was a kind of balloon that represents how love lifts us. Here’s the Robert Browning “Rabbi Ben Ezra” that inspired me to make the painting. Irks care the crop full bird? Frets doubt the maw-crammed beast? Who gives, then of his tribes that take, I must believe. A brute I might have been, but would not sink i'the scale. Should not the heart beat once ``How good to live and learn''? Not once beat ``Praise be thine! Possessions of the brute,--gain most, as we did best! What weapons to select, what armor to indue. Further. Thou waitedst age: wait death nor be afraid! They this thing, I that: whom shall my soul believe? Thou, heaven's consummate cup, what needst thou with earth's wheel?